Gold Cup winning horse Al Boum Photo and Carlow based trainer Willie Mullins returned to a hero's welcome in Leighlinbridge on Monday evening. Mullins finally secured Cheltenham Gold Cup glory after Al Boum Photo galloped away to victory in the hands of Paul Townend at this year's Cheltenham Festival. 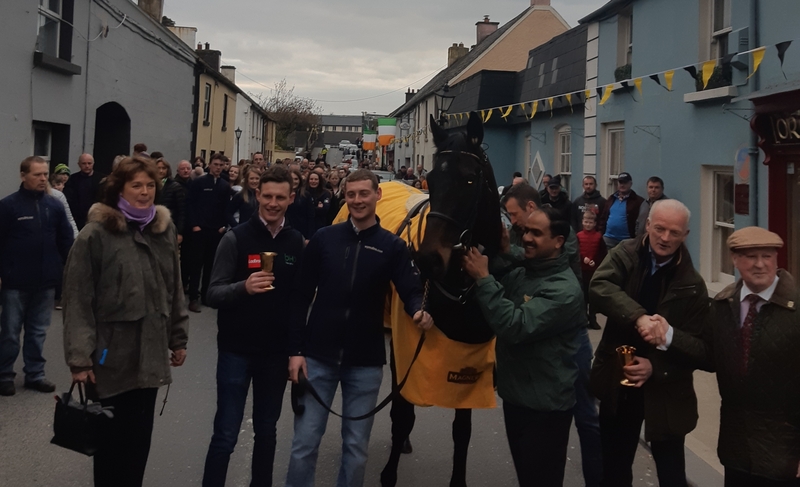 Hundreds turned out as the horse was paraded through the small village of Leighlinbridge with Mullins addressing the crowd gathered outside the Lord Bagenal Inn. "I couldn't believe it as I was watching it unfold, how they were jumping and they were so relaxed," he said about the Gold Cup race. Al Boum Photo is owned by Marie and Joe Donnelly. Mullins had saddled the runner-up in the blue riband on multiple occasions and fielded four this year, with 12-1 shot Al Boum Photo emerging best of all. "Hopefully we'll be back here next year...with a bit of luck," he added. Meanwhile, Cathaoirleach of Kilkenny County Council Eamon Aylward this evening proposed hosting a civic reception in Kilkenny for Willie Mullins. The proposal got the backing of the other council members.